Hello out there in Knit Wit land! We had a fun time again today. Fran and Deb are showing you their newest projects. 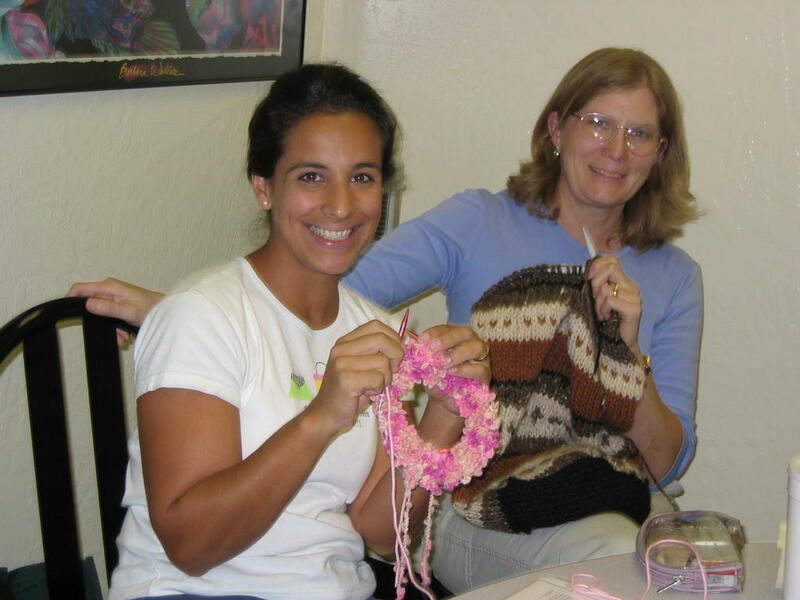 Fran is starting a poncho in a cool bubbly-yarn and Deb is venturing into the land of felting with a design all her own. More photos of these projects will show up in All Things Knitterly’s subsequent posts, so check back often! Linda and DeeDee are working on their projects–remember DeeDee’s poncho using multidirectional strips? She is doing a solid strip here that will be incorporated into the poncho. Linda is knitting little mouse slippers. The foot is made from Homespun that has a brown and black marled appearance. Just like a mouse. This week, I got up close and personal to some mice at my mom’s. I caught four mice on 3 traps. Linda’s yarn is the perfect color, trust me. Can’t wait to see them next weekend. I will take an upclose photo, I know they are going to be really cute. Here are the two Shirleys–Shirley on the right is new to our group today. That’s what makes this so fun, always new people with new ideas! Keeps all our creative juices flowing. 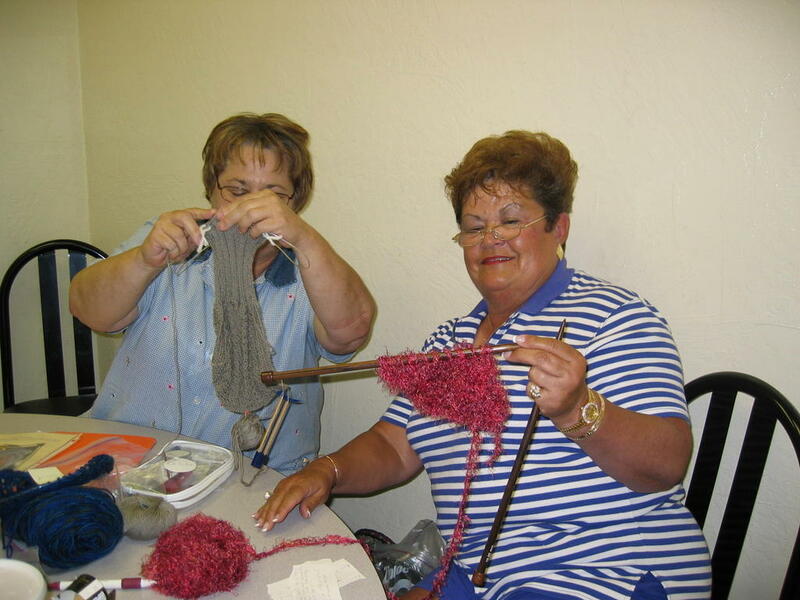 Shirley on the left is showing her Seaman’s Scarf with the ribbed neck. That’s Seaman’s with 2 A’s, not the 5 letter kind. 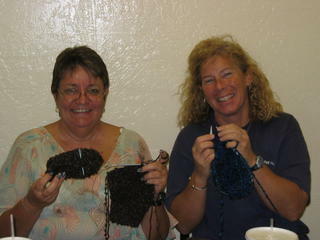 Shirley on the right started this diagonal scarf out of Firenze yarn, and it is verrrrryyyyyyyyyyyy soft. The lucky recipient of this will have a nice cozy scarf this winter! Welcome Shirley! FYI—-the latest on the Kool-Aid dye your own: anyone interested is invited to come to my house next Saturday, September 17 at 1 PM for a demonstration on dyeing your own yarn. My address is 1525 S. 33rd Drive, the first street west of Reagan School off of 16th Street. My house is about 7 or 8 houses down on the right, with bright blue awnings and a mailbox on a stack of rocks. Even if you don’t have your yarn, feel free to come by and watch. My phone is 343-4910. It is truly easy and NOT messy! See you next time at Papa San’s at 1PM! 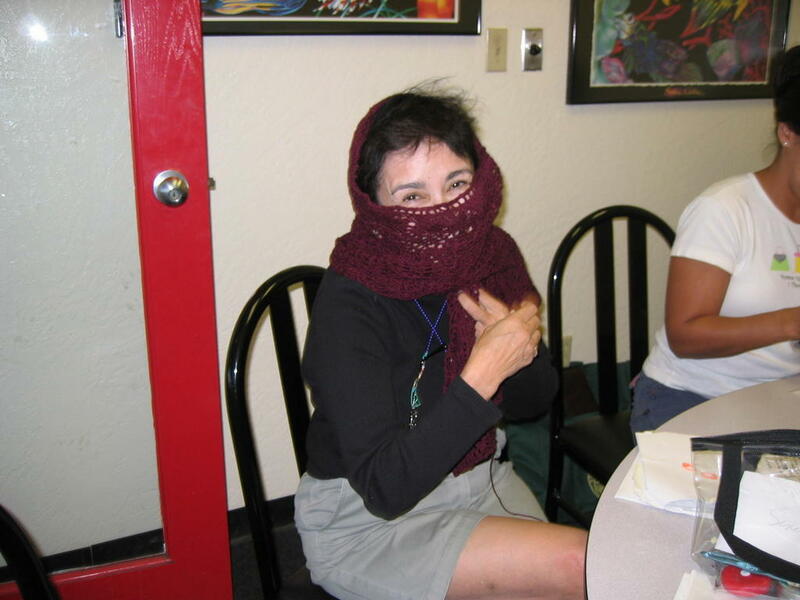 Happy knitting to you!!!!!!!!!!! !